John Wayne. Montgomery Clift. Howard Hawks. Oh, wait, wrong movie. Mechanical larynx sporting Roland Thatcher (Dave Haney) is a business man, preacher and most importantly, a family man. He sells fertilizer, maintains a rustic homestead and always makes sure to introduce his son to the classiest women that stumble upon his abode. Unfortunately for those ladies, his son is a mutant chained somewhere underneath the ramshackle Thatcher place and they are being served to him on a platter. After a rash of local disappearances, a reporter tries to get to the bottom of it all and discovers Thatcher’s secret by serendipity and proceeds to track him down through hillbilly hell and discovers his dungeon of carnage, attempting to save the lives of several campers. Will she live to take her tale to press, or is dinnertime going to extra hearty for the deformed Thatcher beast? 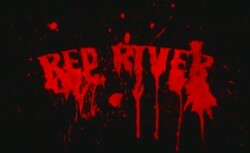 Red River is another of the dozens of schlock pieces that have come out over the years in the vain of Wes Craven’s Hills Have Eyes and Tobe Hooper’s Texas Chainsaw Massacre that understands the subject matter but decides to coast over the point of the films in favor of more gore, more mayhem and mucho silliness. Off the bat, I was a little afraid of the spoofy and low budget tone (actors magically spoke even though their lips weren’t moving and made decisions that Friday the 13th characters would scoff at), but found myself warming up to the film as it progressed. Despite the fact that it doesn’t do anything new, I have a soft spot in my heart for these types of movies and even more so for hicksploitation, the aspect Red River excels at best. Filmed in Kentucky and making no bones about it, the accents are thick and the big ol’ country boys know just what to say to get some chuckles. Horror-wise, the River is definitely Red as unsuspecting souls are murdered in every conceivable way; from sledgehammers to decapitation to impalement to… death by roto tiller! The gore accompanies each kill to the fullest and there is no shortage of the icky stuff in this one, even if some of the effects are a little hokey. If it’s eye candy you want, the country bumpkins are always willing to splash around in the river nekkid and make good use of the privacy of their tents. Thatcher’s use of a mechanical larynx is creepy in theory, but oftentimes makes his goofy wisecracks hard to make out. Humorous are the times when a young man is being chased and moving full throttle, yet this middle-aged man with a belly somehow manages to catch up with him. Must be somethin’ in the eats, I reckon. Like the movie itself, Bloody Earth Films’ DVD release is a mixed bag. Thankfully, there are some special features, such as deleted scenes, video blog, making of, and an effects featurette, but the film is not enhanced for 16 x 9 television sets. Video and audio wise, it looks and sounds decent, but shows off its low budget often. Be forewarned, Red River is 80% tongue-in-cheek and 20% serious horror, so if you’re looking for a film to potentially knock your socks off, this won’t be it. What it will do is make you laugh, maybe even cringe, and give you a nice nostalgic drive-in opening title montage. You’ll have seen better, but sat through much worse in the backwoods genre, and at the very least it beats most anything you’ll find on a Pendulum indie set from Mill Creek ten-fold. Experienced campers know the drill, but may God and Roland Thatcher have mercy on the uninitiated… Rent it!